No matter how you’re feeling, these techniques will come in handy. Cover the egg with a microwave safe plate and start by cooking for around 40 seconds. Remove the cover and check the eggs. Are they set? Do they look like they’re cooked? If not, continue cooking in 20 second intervals until they are finished. Again, cooking times vary based on what kind of microwave you have and how powerful it is. Remove eggs carefully with a slotted spoon and place on toasted english muffin/bread, or whatever you desire. Beat all ingredients besides butter together in a bowl. Put butter in a saucepan and melt over low heat, then slowly add egg mixture while whisking. Continue whisking for around 6-7 minutes, or until sauce has thickened. Serve immediately. If your sauce breaks or is too thick, add a splash of warm water and continue whisking fast. So there it is – an easy yet impressive breakfast for tomorrow morning, or any time. Hope you all have a fabulous New Year! 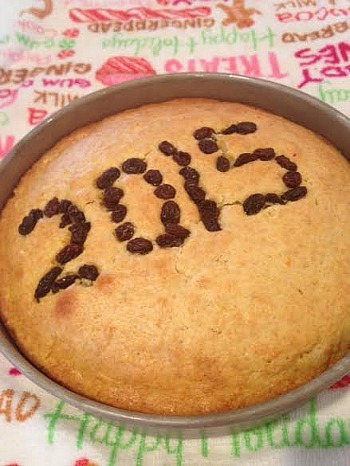 Here’s to 2015…I’ve got my Vasilopita and my lentils ready to go! 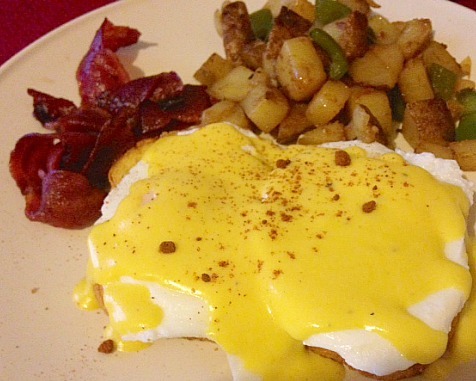 This entry was posted in breakfast, condiments, eggs, lemon, QuickAndEasy, sauce. Bookmark the permalink. Not that I have used…but I guess another acid, maybe white vinegar?